I’m the kind of person who will decide what I want for breakfast the night before. I’ll go to bed dreaming of a delicious bowl of porridge, or possibly a creamy & smooth smoothie, or some toast with mashed bananas and tahini. 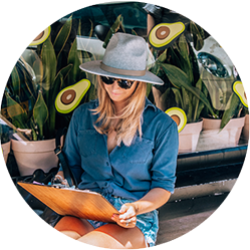 Or maybe some avocado. Mmnmm I’m always up for some avocado! Anyways. I had some apples that needed using up, and I wanted something with a bit more oomph than a plain ol’ porridge bowl. I wanted something baked, crispy, warming, and borderline indulgent. It’s not too much to ask for is it? Didn’t think so. 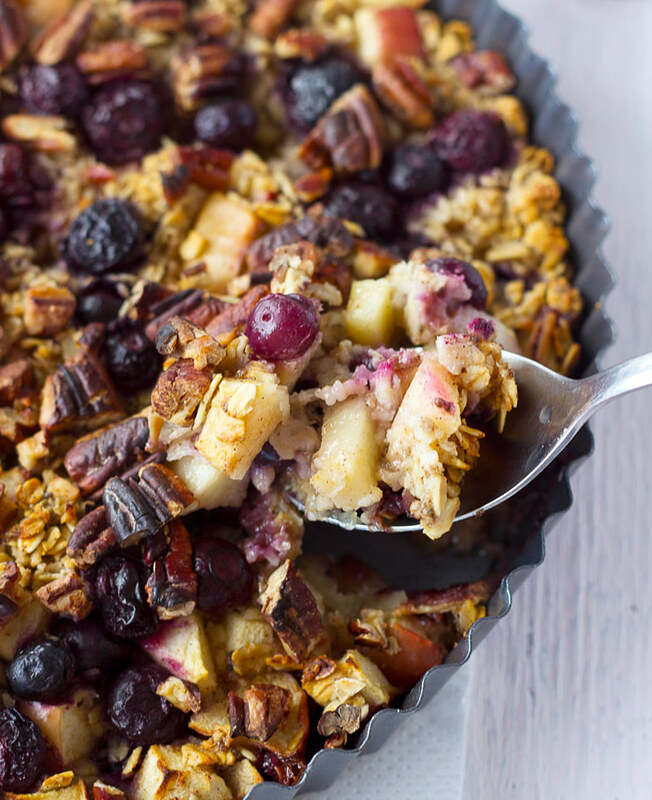 Who knew a blueberry apple pie baked oatmeal was the answer to all my breakfast prayers! The top of this bake is deliciously golden, and the sweet apples pair perfectly with the cinnamon and ginger, while the blueberries take it one step further and give that slightly tart twist that doesn’t let this dish feel too sickly sweet or heavy. The nutty pecans also really come through, and the warmly blueberries burst in your mouth while the apples are tender and soft. As I pull my baked oatmeal out of the oven, bubbling and oozing, the house is fragrant with spices like cinnamon and baked goods and I’m ready to dive in. It’s impossible to now like this baked oatmeal. It’s like you’re having a delicious dessert for breakfast, and it’s almost like it should be a guilty treat but you know it isn’t. In fact it’s full of goodness, so it really is the perfect way to start the day. Oh, and er, word to the wise, avoid using a removable bottom. As this is quite a liquid-y mixture it will decide to seep through and make you go into panic mode, running around the kitchen with your dish in hand, trying to think of how on earth to stop the leakage. In the end, I placed said pie dish in a baking tray, and then into the oven. It still worked, but just meant more cleaning up and some precious liquid lost. Don’t do this guys, it’s not worth it. Just use a proper dish ok? Cool. This is a perfect mid-week or weekend breakfast, as it's not complicated to make at all! In the oven for 30-40 minutes and you can enjoy some delicious baked oatmeal that tastes indulgent but is full of goodness! Start by preheating your oven to 175ºC/350ºF and lightly greasing a pie dish. In a large bowl, combine your rolled oats, spices, salt, and baking powder. In another bowl add your almond milk, chia seed gel, coconut oil, syrup, and vanilla and stir until combined. Pour the wet mixture into the oat bowl and mix, folding in your chopped apples and half of the blueberries until evenly spread throughout the mix. It's ok if it looks a bit liquid-y, the oats will soak it up as they bake! Gently pour into the pie dish and sprinkle remaining blueberries and the pecans on top. Bake for 30-40 minutes, until apples are tender and oats are golden on top. You kitchen will start to smell so yummy, but resist pulling this out too soon! It's worth the wait ok? Serve warm, with a dollop of cooling coconut yoghurt on top. Hey Buddy!, I found this information for you: "Blueberry Apple Pie Baked Oatmeal". Here is the website link: https://www.sprinkleofgreen.com/blueberry-apple-pie-baked-oatmeal. Thank you.